BACKGROUND: Bovine Taenia saginata cysticercus infections (also called bovine cysticercosis or beef measles) is usually diagnosed in cattle only during post-mortem meat inspection. 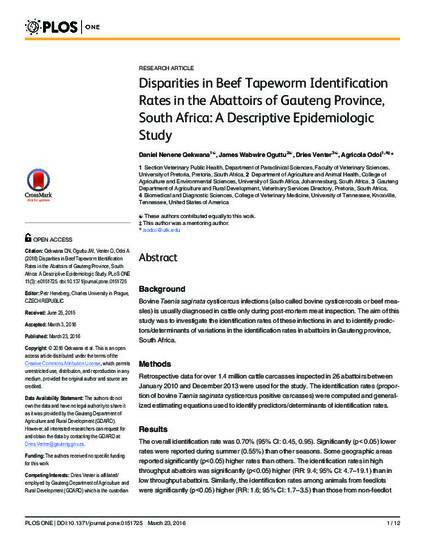 The aim of this study was to investigate the identification rates of these infections in and to identify predictors/determinants of variations in the identification rates in abattoirs in Gauteng province, South Africa. METHODS: Retrospective data for over 1.4 million cattle carcasses inspected in 26 abattoirs between January 2010 and December 2013 were used for the study. The identification rates (proportion of bovine Taenia saginata cysticercus positive carcasses) were computed and generalized estimating equations used to identify predictors/determinants of identification rates. RESULTS: The overall identification rate was 0.70% (95% CI: 0.45, 0.95). Significantly (p< 0.05) lower rates were reported during summer (0.55%) than other seasons. Some geographic areas reported significantly (p<0.05) higher rates than others. The identification rates in high throughput abattoirs was significantly (p<0.05) higher (RR: 9.4; 95% CI: 4.7-19.1) than in low throughput abattoirs. Similarly, the identification rates among animals from feedlots were significantly (p<0.05) higher (RR: 1.6; 95% CI: 1.7-3.5) than those from non-feedlot sources. No significant (p>0.05) association was identified between identification rates and either the number of meat inspectors per abattoir or the provider of inspection services. CONCLUSION: Although no significant association was found between identification rates and provider of inspection services, follow-up studies will need to be done to specifically investigate the potential conflict of interest arising from the fact that abattoir owners hire meat inspection services directly. Capture of abattoir surveillance data needs to include farm address and for each case to be reported separately. Finally, information on the type of identified cysts (alive or calcified) need to be collected to help better estimate risk to consumers. This study provides useful baseline data to guide future studies, surveillance and control efforts.